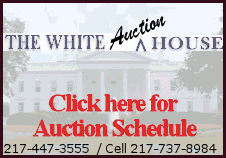 Click on Maske Auction Service ad for sale bills and listings of auctions and goods. TRUCK: 1976 IH Loadstar 1600 2 ton truck w/13.5' Knapheide bed, grain & stock rack (46,700 miles). COMBINE: JD 9400 combine, serial #670220, 1706 hours on engine, 1285 hrs. on separator DAS, F&A; JD 920 grain table/poly; JD 494 corn head w/plastic; Meteor corn reel – 4 or 6 row. WAGONS: DMI D320 Big-Little side dump wagon w/lg. tires; DMI D470 Big-Little side dump wagon w/brakes; 2 Ficklin seed wagons; Kilbros 375 grain wagon w/JD 1074 gears. MACHINERY: JD 630 24' disc w/hydr. down pressure wings w/harrow; Kewanee 380-24' field cultivator; Kewanee 9 shank chisel plow w/leveler; IH 415 – 15' cultimulcher w/Rimlinger harrow; IH 7 shank ‘V' ripper; JD semi-mount 1350/1450 mow board plow 5-16 w/harrow; Woods 6' 3 pt. mower; 9' 3 pt. sickle bar mower; Woods HD 315 batwing mower; JD 7000 8 row wide planter w/hydraulic fold, independent markers, insecticide boxes, no till trash whippers, JD monitor w/acre counter; JD corn meters & Kinze bean meters; JD 845 8 row wide folding row crop; JD grain drill w/clover seeder; Blumhardt 3 pt. 300 gal. sprayer w/48' booms; JD 22' harrowgater; JD 400 – 4 row hoe; 4 row wide cultivator; 7' 3 pt. blade; 3 pt. bale mover; Allied Truckloader 30' auger w/electric motor; Mayrath 63' auger w/hydraulic swing away; CD Edwards 56 6' pull-type road grader; 125 gal. saddle tanks. MISCELLANEOUS: Wards Powr-Kraft 180 stick welder; PTO seeder; PTO fence winder; port. fuel tank w/hand pump; JD A-18 pressure washer; chop saw w/B&D motor; anvil; drill press; welding table w/vise; 12 ton hydr. jack; Homelite 140 – 4 cycle gas trans. pump; elect grain tester; gas engine for 30' auger; corn sheller rake w/elect. motor; 7 hp Bachtold mower w/B&S motor; 5 hp HWI garden tiller; Lawn Boy 19" push mower; iron and lumber pile; Stylematic sink; 3 Jeffers cat. 2 quick couplers; fence posts and charger; hog/cattle panels; horse tank; garden planter; JD cylinders; Century kerosene shop heater; Hypro hydr. pump; Ace pump (PTO driven); med. pickup tool box; Homelite 16" chain saw; tool boxes & organizers; doors; GE elect. dryer; picnic table; Homelite weed eater; sleds; bicycles; metal shelving. AUCTIONEER'S NOTE: This is a fine line up of JD equipment, all well maintained and shedded. There will be fewer than 4 racks, so get there early. OTHERS WILL SELL: 1973 Oliver 1655 tractor w/4560 hrs; 1972 Ford 8600 tractor w/4145 hrs; IH 480 18.5' disc; IH 45 18.5' field cultivator; JD 7000 - 4 row wide planter; Glencoe 4 wide cultivator; Bush Hog 10' chisel plow; Gehl 6' flail chopper; JD 3 pt. rotary hoe, tool bar type; JD pull type sprayer; IH 6 wide rear mt. cultivator; 2 Kilbros 350 gravity wagons w/10 ton gear; Sunflower 4211 disc chisel; Case 500 4/18 plow; JD 1000 24' field cultivator; Chemfarn 3 pt. 42' sprayer w/saddlebag tanks; JD 400 6-row rotary hoe; Bush Hog harrowgator; Kraus 790 12-shank chisel plow; JD RG 430 & 630 cultivators; David Bradley wood box w/hoist; wood & metal flare bed wagons; hog moving crate; 3 pt. bale fork; IHC 900 vertical fold 12-30 corn planter w/insecticide, furrow openers and monitor; 2 Kilbros 350 gravity wagons on JD 1065 gears; JD 643 corn head (low tin). Wednesday, Dec. 12, 2007 7:00 p.m.
REAL ESTATE: 80 acres located in the north half of the southeast quarter of Section 36, Williams Township, Sangamon County, Ill.
TRACT ONE: 3.86 acres, dwelling and improvements located at 11435 Dana Lane, Williamsville, Ill. This two-story wood frame dwelling has one bath, 4 bedrooms, full basement, and attached two-car garage. Additional farmstead improvements consists of water well, septic system and a modern machine shed w/concrete floor. REAL ESTATE TERMS: Buyer(s) to enter into a written contract requiring 10% down on the day of the auction with the balance due upon delivery of deed at closing. Closing to occur on or before January 14, 2008. Tract One (Farmstead) will be sold on a lump sum basis and will be sold "As Is Where Is." Tract Two (Farmland) will be sold on a per acre basis where the sale price will be calculated by multiplying the high bid times 75 acres. These are stated settlement acres but are not guaranteed. The Seller will furnish title insurance commitment in the exact amount of the purchase price and pay the 2007 real estate taxes due in 2008. The Buyer(s) will pay the 2008 taxes payable in 2009 and subsequent years taxes. Possession, at closing, will be subject to the rights of the current farm tenant, Roger Bock, under the rights of the current crop share lease which expires the last day of February, 2008. The current lease has been terminated. Announcements on the day of the Auction will take precedence over any matters previously announced, published or advertised. The Seller reserves the right to reject any and all bids. There are no express or implied warranties pertaining to this property. A copy of the title commitment and sales contract will be available for inspection prior to the auction by contacting the office of Charles Burton, Rushville, Ill. (217) 322-4303.